This post for #Choctoberfest is sponsored by Barlean’s. I have received sample products for writing this post. All content and opinions are mine. These Double Chocolate Pumpkin Energy Bites are a healthy sweet treat… and they pretty much taste like a brownie, so there’s that too. Another day, another #Choctoberfest recipe! This one slightly healthier than the delectable cake from Monday. 🙂 Energy bites, granola bites, energy balls… whatever you call them… are SO tasty and SO fun to make. Just mix, roll, and chill, pretty much. They’re great to have on hand for a healthy yet filling snack option or even a quick breakfast on the go for busy mornings. Most recipes use nut butter as the base, so I was excited to find a version that used PUMPKIN as the binder. I always gotta do something different, haha. Since we’re smack-dab in the midst of #Choctoberfest, I decided to try to make an uber chocolately energy bite recipe. Thanks to a healthy dose of dark chocolate cocoa powder AND dark chocolate chips, these Double Chocolate Pumpkin Energy Bites pretty much taste like a brownie. I’ve been keeping some in the fridge at work, and they are perfect for a mid-afternoon snack. Healthy, yet satisfying. I’m so thankful that Barlean’s is a sponsor again this year for #Choctoberfest! They sent me a great package filled with Chocolate Silk Greens (think chocolate protein powder, but powdered greens instead–this stuff is great for smoothies! ), Essential Women Omega-Swirl Chocolate Mint (mint-chocolate syrup that just so happens to be full of Omega-3s), and Butter-Flavored Coconut Oil, which I used in this recipe. It’s the perfect butter substitute with all the health benefits of coconut oil. I don’t use coconut oil for everything but I really like it in granola bars/energy bites. You can find out more about Barlean’s by following them on Twitter, Facebook, Pinterest, or YouTube. One of the best parts about these Double Chocolate Pumpkin Energy Bites (besides how chocolately they are!) is that it only uses 3 tablespoons pumpkin puree. Sooo it’s a perfect recipe to have on hand to when you have a little pumpkin puree to use up! Waste not, want not. And how could you not want these yummy chocolate energy bites??! Enjoy! Find more chocolate recipes here today at the #Chocotoberfest linky! And don’t forget to enter this great giveaway before Saturday! In a large bowl, stir together oats, flaxseed, cocoa, and pumpkin pie spice. In a small saucepan set over medium heat, whisk together honey, maple syrup, pumpkin puree, and coconut oil. Bring to a boil, and allow to boil for 4 minutes. Stir constantly so it doesn’t burn! Remove from heat. Pour honey mixture over oats and stir until combined. At this point, you can stir in the pepitas and chocolate chips so the chocolate melts and gets all gooey OR you can wait for 5 minutes before stirring in the mixins. I stirred everything together right away. Cover and refrigerate for at least 30 minutes for mixture to cool and chocolate to harden, then remove and roll into 1 1/2 inch balls. Place on a baking sheet and refrigerate for at least an hour before transferring to an air-tight container. Store in the refrigerator or freezer. Enjoy! Disclosure: Though I received products for free as part of my participation in #Choctoberfest, I was not compensated in any other way and was not asked to provide positive feedback. Hi guys! Another new recipe! Who am I?!? I just had to take some of my free time to share this no bake granola bar recipe with you… because frankly, I’m obsessed with them. I’ve made two batches in just as many weeks… and eaten almost all of them myself! 🙂 You know what else I’m quickly becoming obsessed with? Babywearing! Having two hands to use during baby naps [that he prefers to take on me or on Ben] is priceless. I have a Baby K’Tan and it’s purple and fabulous. I can even cook while wearing it! Well, cooking is a bit of a stretch, but I definitely can make really easy recipes as long as they don’t involve putting something in the oven or any potential splatters from the stovetop. Paranoid, safety conscious new mom here! Probably for a good reason, but still. Anyways, back to this deliciousness! And no, I’m not talking about this cute ONE MONTH old baby here. Though he IS delicious and adorable, huh? What do you think I should call him on the blog? Due to his privacy and not wanting to make more of an online trail for him in the future than necessary, I don’t want to share his full name here. Before he was born, we joked around that his name would be “Volde,” as in Voldemort so his current Instagram hashtag is #BabyVolde. We might stick with that, or we might adapt one of his [many] family nicknames. Most of them have to do with foxes, because we chose woodland animals as his nursery theme. Gah, I way overthink EVERYTHING. Haha. This cutie has his eyes open more and more these days… he’s so fun! Moving on… no good transition, but I gotta get moving as naptime will be coming to a screeching halt any minute now. 🙂 These granola bars. They are no bake, amazingly delicious, and SO simple to throw together. Since I made my first batch, I’ve eaten one just about every day. Err, night. Middle of the night feedings make me hungry! Or maybe it’s just being up in the middle of the night that makes me hungry. Either way, I learned very early on in this little one’s life that I needed a healthy snack to eat in the middle of the night when I was up with the babe. Granola bars are the easy choice, right? For a couple weeks I was buying [or sending Ben to buy] the more wholesome granola bars from the grocery store… but then I felt like baking. So I decided to make my own using healthy ingredients that I had on hand! Some oats, Rice Krispies cereal, nuts, honey, peanut butter, and chocolate later, these babies were born. I was a little unsure of how they would turn out using natural peanut butter as the base, but I’m happy to report that they stick together just fine if you store them in the refrigerator. Score! They do get a little melty at room temperature, but I’m sure you can eat them quickly enough to remedy that problem. I know I sure do! The classic combo of peanut butter and chocolate is one that I don’t tire of easily. Reminds me of eating candy, so much so that I have to stop myself from setting the baby down partway through a feeding to go get another granola bar. No joke. These granola bars are that good! With that in mind, it’s probably for the best they need to hang out in the fridge so they last a little longer. I bet they would freeze well too, though I haven’t tried that yet. 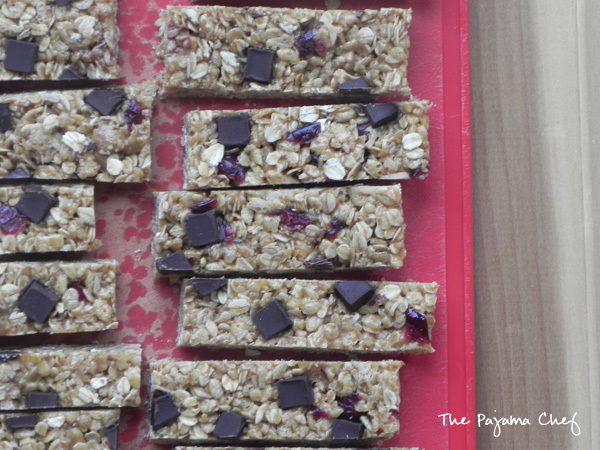 Hope you can make these granola bars soon–you won’t regret it! Enjoy! Grease a 9×13 pan with cooking spray and set aside. In a small saucepan, melt together peanut butter, honey, coconut oil, and cocoa powder over low heat. No need to boil, just heat until melted together. Remove from heat and stir in vanilla. This step can also be done in the microwave if desired–just mix in a bowl and heat on 50% power until melted. For me, this was about 45 seconds. In a large mixing bowl, stir together oats and Rice Krispies. Pour peanut butter mixture on top and stir to combine. Fold in mix-ins, then transfer to prepared pan. Use a sheet of wax paper or a spatula to press down and flatten. Cover and refrigerate at least an hour, or up to overnight to set. After bars have set, cut as desired. Store in the refrigerator or freezer, especially during warm/humid months. I am so excited about these chewy granola bars, you guys! They are simply the best. 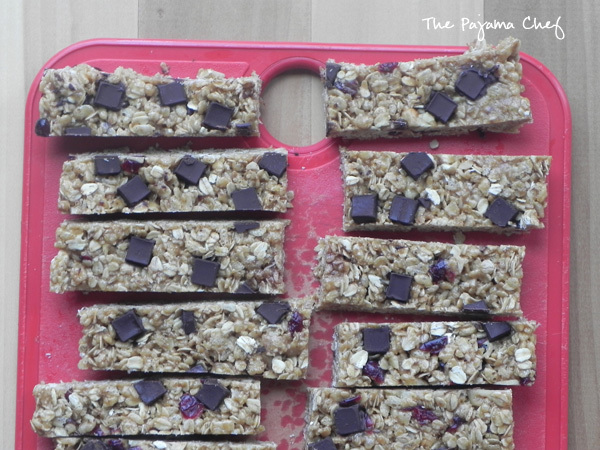 I’ve shared other granola bar recipes on my blog before, but these take the cake. Literally. I think I’d have one before I had a piece of cake, if only because they are healthy AND chocolately at the same time. Win win, I say! In the past, homemade chewy granola bars just haven’t cut it for me because they’ve included ingredients I want to avoid on a normal basis [corn syrup] or because they’ve been so full of liquid sweeteners like honey or maple syrup that they’ve just been sticky and hard to eat on the go. So one day I was thinking about what could make chewy granola bars better [I’m in the car alot… this is what I do when I’m not paying attention to my book on CD–ha!] and it dawned on me. Coconut oil! Duh. Everyone’s favorite trendy all-purpose health/beauty/cooking product of choice these days. So I gave it a whirl and was SO pleased with the results. 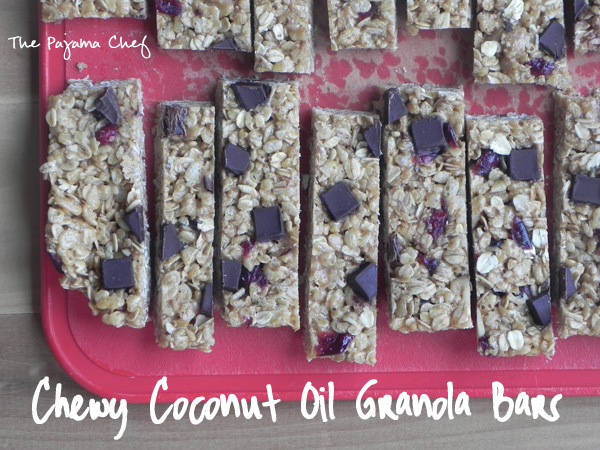 These granola bars hold together well, are easy to cut, and just taste amazing. For those who are curious… they don’t really taste much like coconut, for better or worse–it’s just a hint, and it’s almost more the smell than anything. Line a 9×13 pan with aluminum foil or wax paper, and grease well with cooking spray. In a large bowl, stir together cereal, oats, flaxseed, and mix-ins. In a saucepan, stir together honey, brown sugar, and salt. Turn heat onto medium-low, then stir constantly until mixture comes to a boil. Boil for 60 seconds, then remove from heat and gently mix in coconut oil and peanut butter [be careful of splashes!]. Stir in vanilla and cinnamon. Pour wet ingredients over the dry and mix to combine. Press mixture into prepared pan, then evenly distribute chocolate chunks over top. If you mix the chocolate in, it will melt. Press into granola mixture with a spatula then cover and refrigerate for 2 hours to set. Cut into bars and wrap in aluminum foil or wax paper for easy transport. 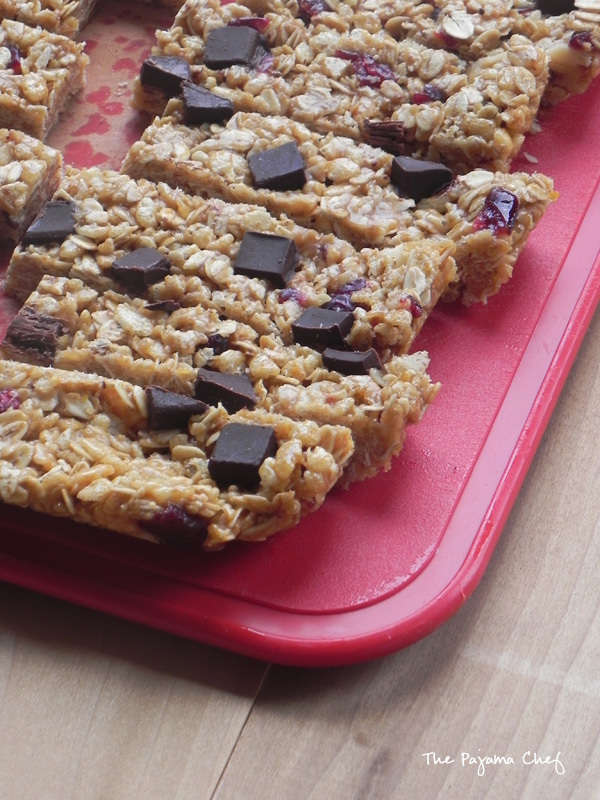 Granola bars freeze well and stay fresh in the refrigerator. So… I’ve been making granola a lot. Like, every other week. This recipe, to be exact. Cinnamon Applesauce Granola is the best stuff ever. I know I said this before, but it’s pretty low in sugar AND it’s very flavorful. Perfect for eating by the handful or in yogurt. But guess what? I’ve found a way to make it even crunchier AND chunkier. Because chunks of granola are the best thing ever!!! And now, for my second granola tip… you might be wondering why there are little jars of granola in front of my big tin of granola. 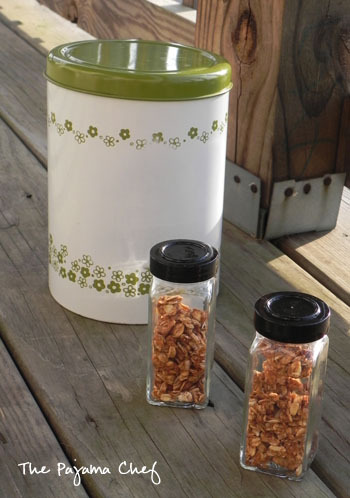 [Some people keep a cookie jar on their counter… I keep a tin of granola.] Those, my friends, are thoroughly washed glass spice jars. Like the kind from my friend and yours, Mr. Trader Joe. These jars specifically are 2 ounces, which I have found is the perfect amount of granola for the 6 ounce cups of yogurt I buy every week at the grocery store. 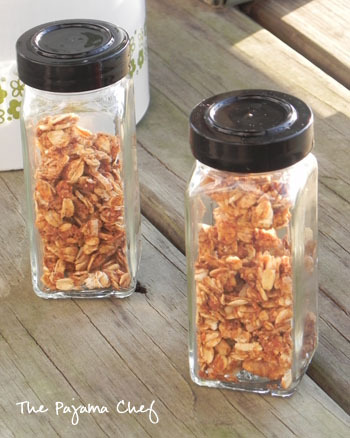 If you take your breakfast or lunch with you to work or school, or just need a snack for the day, putting your granola in small glass spice jars keeps it fresh and smash-free. Sometimes when I was putting it in little plastic baggies, my granola–even the larger chunks–would get crushed by the rest of my lunch before I had the chance to eat it. This solves the problem, plus is a bit more environmentally friendly! I have quite the collection of these spice jars amassed so at the beginning of the week, I’ve started dishing up the granola for lunches for the week, ready to grab and go every night at lunch-making time. Works for me! If you don’t have a collection of glass spice jars ready now, then you can probably buy something similar at an organizing store, or just wait a few weeks until you finish a spice. What are your granola-making tips? Recipes? I’d love to hear them below in the comments. 🙂 Have a good Monday!